Gaussian Mixture Models (GMMs) are a popular choice for modeling probability density functions, with a vast number of applications in speech and audio technologies and machine learning in general. For classification, one can use class-dependent GMMs and easily build a probabilistic classifier using Bayes rule. The problem here is, that the classical way to train GMMs, i.e. using the maximum likelihood principle and applying the expectation-maximization algorithm, is not aware of classification. 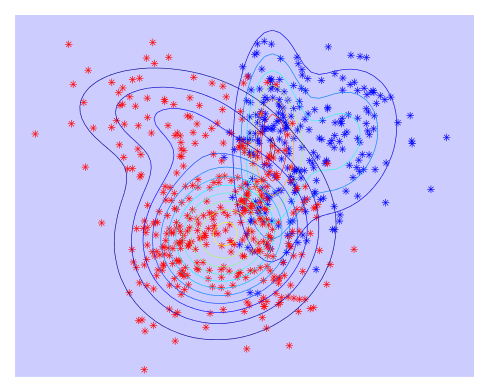 This generative training typically yields sub-optimal classifiers. On the other hand, when the classifier is trained in a purely discriminative way, the model actually looses most of its probabilistic semantics. R. Peharz, S. Tschiatschek, F. Pernkopf, "The Most Generative Maximum Margin Bayesian Networks", ICML, 2013.